May 28, 2015 0 comments on "Daily Shower Cleaning Spray"
No one likes cleaning the bathtub and shower. I finally found a great homemade miracle shower and tub cleaner, but I was still looking for a spray I could use more often, like every time I take a shower. This homemade shower cleaning spray really does the trick. This homemade daily shower cleaning spray is really easy and inexpensive to make. The vinegar will help keep mold and mildew from growing in your shower, so that when you are ready for doing a deep cleaning, it will take less time than ever. 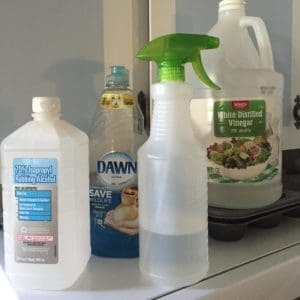 Combine all ingredients in an empty, clean spray bottle. You can add essential oils if you like. Add 15 drops of your favorite essential oils like tea tree oil or lavender oil. Tea tree oil will actually help keep bacteria from growing in your shower. Apply this shower spray to the shower walls immediately after showering, and you will be amazed at how clean your shower will be!